I’ll be posting this new series this week for everyone who could not make it out to listen. But until then, let me say a deep heartfelt thank you to each one of you who was praying for this event. By the third presentation, the paradigm shifts for some attendees were so profound they felt as if they were encountering Jesus for the very first time. The students at the college responded overwhelmingly well, also—Renewed Heart Ministries and the college are looking at dates when I can come back and spend an entire week with the students there. When I finished Saturday evening, I spent over an hour with folks who stuck around asking questions, sharing thoughts, and expressing deep gratitude for the new ways of looking at God, others and ourselves, including our enemies and those whose enemies we’ve become. The early Christian writers (patristic writings) and Jesus followers in the first millennia of Christian history taught that Jesus’ death and resurrection saved us—not by appeasing an angry God, but rather through victoriously delivering humanity from “sin,” death, and “the Satan.” This series looks at that teaching through the lens of the Jesus story itself. There are six terms Paul uses to refer to this trifecta Jesus overcomes: sin, death, the powers, law (eye for an eye), wrath, and the present evil generation. 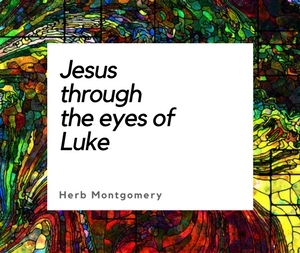 Built on this foundation—six different ways of referring to three realities—this series is a treatment of each one of these “three” through the lens of Jesus’ life example and teachings on nonviolence. For those of you who support Renewed Heart Ministries, I cannot thank you enough for partnering with us in what we do. This was a fantastic weekend! The lights truly came on for so many who attended, and the reign of Christ (the Kingdom) was genuinely enlarged in Northern California. Together we are changing lives, one person at a time, helping those Jesus died for step over from the present evil age of today into what Jesus called the Age to Come, from death to life! Remember, Christ’s Kingdom involves a radical new way of living life here on earth, based on radical paradigm shifts in how we see God, others and ourselves. To all those who attended this weekend and chose to become a follower of Jesus—either for the first time, or in a way that goes deeper than you previously had gone—welcome to the Kingdom!